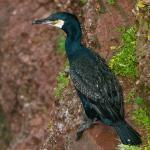 Pelagic Cormorant: Breeds from the Bering Sea south to northern Baja California. Spends winters south of southern Alaska. 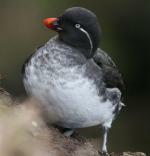 Preferred habitats include offshore and inshore waters. 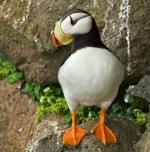 This bird uses its own guano to solidify its nest materials and to cement its nest to the cliff face. A group of cormorants has many collective nouns, including a "flight", "gulp", "rookery", "sunning", and "swim" of cormorants.